Newbridge on Usk01633 413000work01633 410236fax Restaurant with RoomsOwned and run by the world famous Celtic Manor Resort, the Newbridge on Usk - an award-winning five star, two AA Rosette Restaurant with Rooms - is a quaint country inn located in a picturesque rural location on the banks of the River Usk. Situated only a short distance from Celtic Manor itself, this 200 year old inn is the perfect location for a stylish country escape to relax and unwind, offering six beautifully decorated en-suite bedrooms. Styled like a traditional country inn with a unique contemporary twist, the two AA Rosette award-winning inn at the Newbridge on Usk features rustic wooden floors and fireplaces where you can sample a local ale and soak up true Welsh hospitality at its finest. Reflecting the setting, the wholesome country fare is freshly prepared using locally sourced ingredients. 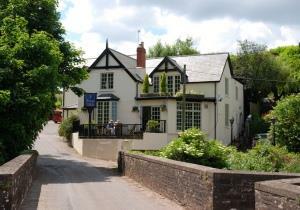 Owned and run by the world famous Celtic Manor Resort, the Newbridge on Usk - an award-winning five star, two AA Rosette Restaurant with Rooms - is a quaint country inn located in a picturesque rural location on the banks of the River Usk. Situated only a short distance from Celtic Manor itself, this 200 year old inn is the perfect location for a stylish country escape to relax and unwind, offering six beautifully decorated en-suite bedrooms. This unique venue is in a wonderful position beside the river, offering a fantastic alternative location to host corporate events, meetings, private functions and weddings.